Each Aloha Shirt is created to capture the beauty and spirit of our incredible islands. 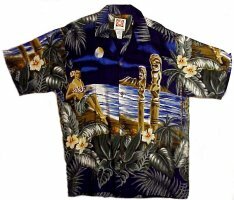 These aloha shirts are designed with an enlarged image or scene on the back of the shirt. 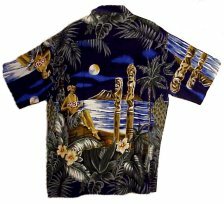 In this Aloha Shirt we show off a Classic Hula Girl, singing under a romantic Hawaiian Moon!